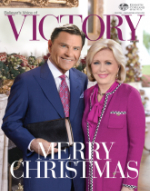 The Believer’s Voice of Victory broadcast reaches more than 885 million viewers worldwide each day! Enter your location to find when and where it airs near you. 13:00 - 13:30 From Roodepoort to Krugersdorp, Dobsonville, Newlands, JHB Centre, Kagiso, Soweto, Bosmont, Maraisburg, Randfontein. 5:30 - 6:00 Reaching the greater Buffalo City region, as well as Port Alfred, Stutterheim and Morgan Bay. 21:30 - 22:00 From Pretoria to Midrand, Centurion, Brits, Cullinan. 5:00 - 5:30 From Springs, Brakpan, Benoni, Boksburg, Alberton, Germiston, Nigel. 13:05 - 13:35 Port Elizabeth. 20:30 - 21:00 (repeat) Windhoek, Okahandja, Rehoboth.